set of allen bolts for one puch 5 star hub, front or rear!! you know those two bolts on the top of a puch maxi front fork? yup!! ADD TO CART TO CHECK STOCK!! indulge in maxi swing arm rejuvenation at the treatland spa! treat your swing arm to some new hardware, it deserves it! this is the complete set of hardware you need to mount the rear shocks on your maxi to the frame and swingarm!!! get it??!?! hopefully!!! keep in mind this is stock WITHOUT buddy pegs. buddy pegs will use longer lower m8 bolts...no buddies with one, no friends, all alone, forever!!!!! i mean, no one rides for free anyway am i right? this is the complete set of hardware you need to mount the rear shocks on your magnum to the frame and swingarm!!! get it??!?! hopefully!!! this version has long enough bottom bolts to allow for buddy pegs! if youre into that type of thing! drain bolt for the puch e50 motor... you know you need one. take that JB weld out of there and put the bolt back in man!! 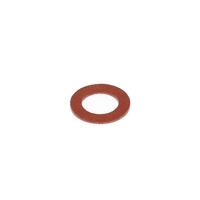 drain bolt WASHER gasket for the puch e50 motor... you know you need one! this is also both the drain bolt and the fill bolt for tomos A35 and A55 engines, tomos part #s 026311, 230173, stoked! has a lil corrosion but could easily be cleaned up! HERE NOW! M8 hex head bolts - partially threaded. this size is used all over on so many different mopeds! HERE NOW! M8 hex head bolts - fully threaded. this size is used all over on so many different mopeds! we have 10mm, 12mm, 16mm, 20mm, 25mm, 30mm, 35mm, 40mm, 45mm, 50mm, 55mm, 60mm, 65mm, 70mm, 75mm, 80mm, 90mm and 100mm. engine mounting bolt + nut + washer party for all puch mopeds!! m8 aluminum drain plug washer! 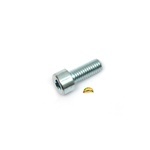 stainless steel m8 allen engine mounting bolt + nut + washer party for all puch mopeds!! puch magnum top shock mounting bolt...XTRA LONG VERSION.. its so nice and shiny and new..
the right length bolts for mounting buddy pegs on a puch...and most others too! universal super helpful ground tab for m8 bolts! OEM honda exhaust stud for MB5! for those days when all you need is a really long bolt and you just cant find one...i hate those days! use these on certain tomos upper and lower triple tree yokes, you know, the bolt that tightens the fork leg on! special tomos a3 transmission fill bolt! m8 x 10mm with 1.25 thread pitch. or use for anything! 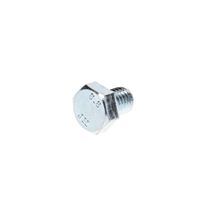 special tomos OEM m8 x 14mm allen bolt. 1.25mm thread pitch. its for mounting rear passenger pegs on a streetmate or revival! use for whatever though! special tomos hex bolt for holding the a35 / a55 oil tank bracket down! m8 x 16mm with 1.25 thread pitch. or use for anything! this is made for the right side footpeg on the kickstart style tomos racing tt !! basically an extension to get it out further. cool thing is, you can use this for any other instance where something m8 x 1.25 thread pitch needs a little extra length...like raising up a mirror or making a pipe bracket or hmm whatever you can think of!! over 180 pieces in total - metric steel bolts, nuts, washers and more in different sizes and types. comes with all you see in the pictures! think about it, if one bolt or nut normally costs $0.60, and you multiply it by 180, thats $108.00 but this kit is less than half that price. yep, so you're saving in the long run actually, less trips to the hardware store, and time wasted searching through buckets of bolts. and in the end, you still have a rad sectioned container for all your moped bits and pieces. yup!! the threaded bolt portion is m8 x 1.25mm, and the hole on the other side is m8 x 1.25mm REVERSE thread!!!! this OEM tomos nut is for the seat post bolts on square post style single seat bikes, and maybe a ton more things that take m8 x 1.25 thread nuts...use it for whatever!!! !